The refuge is famous for providing temporary accommodations to nearly 400 species of migrating birds and other wildlife, so any expedition along these grounds is sure to provide some exceptional bird spottings and subsequent photos. Head out to the local nature trails, or take to the water via a kayak to explore all 30,000+ acres of this fantastic coastal attraction. With nothing but the wind and local songbirds to keep you company on your travels, you'll surely get a delectable taste of the Outer Banks at its most wild. The Pea Island National Wildlife Refuge originated in 1937, when the government sectioned off this parcel of Hatteras Island, spanning from Oregon Inlet to the northern borders of Rodanthe, "as a refuge and breeding ground for migratory birds and other wildlife." This coincided with the origination of the Cape Hatteras National Seashore, an area of beaches designed for visitor recreation, and was an effort to keep areas of the unpopulated Hatteras Island free of development - an initiative that was well before its time, considering that the Bonner Bridge wouldn't even be built until over two decades later. Bear in mind that for decades, well before mainstream tourism hit the beaches, this region was a popular market for waterfowl hunting, recreational and commercial fishing, and even farming operations. Early visitors would make the long and tricky journey to Hatteras Island for the incredible hunting and fishing, and the area now known as the Pea Island National Wildlife Refuge was well-stocked with ducks, geese, and fowl of all varieties that were easy pickings. While today hunting is no longer allowed, visitors can still enjoy observing and "capturing" the hundreds of species with a pair of binoculars or a camera. Hatteras Island, along with much of the barrier islands of the Outer Banks, is an essential region along the "Atlantic Flyway." This designation marks the route that most all East Coast migratory birds take on their way north or south for the season. Naturally, with a cross-country trip that entails thousands of miles of travel, the migrating birds need a place to stop and relax. More often than not, that "spot" entails a coastal region of North Carolina, particularly along the Outer Banks, which offers miles of undeveloped land and diverse habitats for all kinds of species. Because the refuge was partitioned off with the goal of conservation in mind, hundreds of thousands of birds find they have a safe "pit stop" to relax for a few hours, a few days, or even a few months before continuing on their north or south bound journey. Heading south on NC Highway 12, a visitor will enter the Pea Island National Wildlife Refuge just as soon as they cross the Herbert C. Bonner Bridge. The boundaries of the refuge are pretty easy to identify, as the refuge begins on the southern edge of Oregon Inlet and extends all the way to the town limits of Rodanthe. Because of this, vacation guests staying along the borders of Rodanthe will often find that they are located right next to the refuge, with phenomenal unobstructed views of the soundside from a breezy back deck. If this sounds like an enticing locale to you, simply check with your vacation rental company before your next visit to see what vacation homes they have available along the refuge's perimeter. The refuge has 5,834 acres of land in addition to 25,700 acres of water, and is approximately 13 miles long with a width that varies from a half mile, (or even less during a sever high tide), to a full mile. The environment here is wildly diverse, with ocean beaches and high and dry sand dunes, fresh and brackish soundside ponds, low-lying salt flats, and salt marshes. Several of these species are also engendered, including peregrine falcons and loggerhead sea turtles, which makes the maintenance of this area even more imperative to refuge management. And while over 2.7 million visitors pass through or visit the refuge in some aspect every year, via the gorgeous oceanside beaches or the scenic nature trails, visitors would never guess it was that popular. The refuge remains quietly unpopulated throughout the year, with plenty of quiet areas to set up a camera or a chair and wait for the birds to take flight. 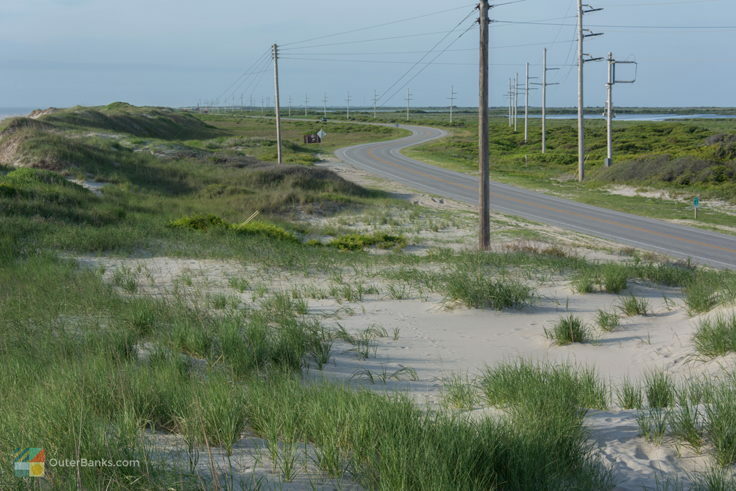 Most visitors to Hatteras Island will simply explore and enjoy the refuge from the comfort of their own vehicle as they pass through en route to one of the seven Hatteras Island villages or Ocracoke Island. That said, just because you're taking a scenic and all but required drive through the area to get to your destination doesn't necessarily mean you won't spot some incredible vistas and samples of the local wildlife. About five miles from the Bonner Bridge, keep a look-out on the soundside of NC Highway 12. This region has a number of small ponds or salt flats that border the edge of the road, and are often home to a number of seasonal birds that are clearly visible from NC Highway 12. Depending on the time of year, passer-bys may spot massive congregations of Canadian geese, egrets, white swans, and ducks loitering around these roadside parcels of water and land. Visitors who come to Hatteras Island in the early spring should watch out for white pelicans, who make rare and seasonal appearances along these ponds, and despite their large size can be sometimes hard to spot as they shimmy through the shallow puddles of thick mud. The center can be seasonally staffed with friendly volunteers, generally from 9:00 a.m. until 4:00 p.m. and features a wide parking area, restrooms, and several information kiosks pointing out the highlights of the refuge's species and environments, and pointing the way to two nature trails. There's also a small gift shop on site where visitors can pick up a field guide or even a T-Shirt, with proceeds going towards conservation efforts for the refuge. Across the street, visitors will find easy access to a wide ocean beach which is ideal for quick shore side expeditions, and has become renowned in recent years for its exceptional shelling, especially after a winter or fall storm. Visitors will also find two nature trails located close to the visitors center, the North Pond Trail and the Salt Flats Trail. The North Pond Trail begins almost literally behind the visitors' center, and winds across a dike located in between the North and New Field Ponds. Because this trail covers more watery or marshy areas than solid ground, visitors will enjoy a stroll across the "turtle pond," stocked with freshwater turtles) over a wooden boardwalk before meandering to three separate observation platforms, and a two-story observation tower. All platforms have mounted binoculars and informative panels pointing out the species that frequent the area. Bring a camera, as these areas of the refuge are prime birding grounds, and visitors can expect to see everything from snowy egrets to peregrine falcons peeking out over the marshes. The Salt Flats Trail is located along the northern border of North Pond, and also travels across a dike that leads out to the Salt Flats area. This trail is a little more rustic, but it slightly less travelled, and as a result provides miles of privacy and absolutely gorgeous scenic views. In fact, the refuge is so well known for its fantastic, off-the-beaten path nature trails, that it is an important part of the official "Charles Kuralt Trail," a series of trails in North Carolina that explore some of the region's most pristine refuges and reserves. The ponds along the refuge are closed to vessels of all kinds, however kayakers will have ample room to explore around the wide saltwater canals and sound borders of the refuge. To access the area, kayakers can head to "New Inlet," a small soundside parking area located 6 miles south of the Bonner Bridge that features a boat launch and an easy route to the sound. This small launching point is rarely crowded, but the views and the kayaking route are so renowned, that a number of local kayaking businesses take tour groups through the area for wildlife explorations. Feel free to contact the local sporting companies in Rodanthe or Nags Head to find out if they offer a Pea Island National Wildlife Refuge tour, or simply rent or bring your own kayak or canoe along and enjoy a ride at your own pace. Either way, you're sure to enjoy stunning views and fantastic observations of some of the refuge's wild local residents. The Pea Island National Wildlife Refuge has a number of seasonal educational programs and events that are designed to give visitors an in-depth exploration of their wild surroundings. A number of these programs are free, or nearly free, and are simply a come-as-you -are affair, with no advanced reservations required. Seasonal programs include a guided Pea Island Beach Walk, a guided bird walk along the refuge, weekly "turtle talks" which outline the common and endangered species of turtles that are found in the refuge, and special educational sessions that are designed just for kids. The programs generally last an hour or two and are a perfect morning or afternoon excursion for Hatteras Island visitors with a love of the wild environment. For a complete list of events, times, and meeting locales, you can visit the Pea Island National Wildlife Refuge's calendar of events. In addition to daily or seasonal programs, the Pea Island National Wildlife Refuge also hosts two major events that attract attendees from all over the islands, and the state. The annual Crabbing Rodeo is held on the second Saturday in June from 9:00 a.m. - 12:00 p.m. and allows kids of all ages to try hand-lining as many crabs as they can in a friendly, competitive environment. The rewards are a tasty bucket of crabs to take home, and while the event may seem simple enough on the surface, recent years' Crabbing Rodeos have drawn more than 500 attendees. Volunteers are on hand to point out good crabbing spots and to dole out pointers as needed. Free for everyone, (although attendees are responsible for their own drinks, chairs and bug spray), the event is a fun way to get your hands dirty in the local crabbing scene. The annual Wings Over Water festival is the biggest event the Pea Island National Wildlife Refuge has to offer, and entices birders from all over the country and the world to take a trip to Hatteras Island to enjoy a full week of fun activities within the refuge. Well over 100 varying field trips take place during Wings Over Water, with professional and volunteer guides leading attendees on a number of specific tours throughout the region. Attendees can take a kayak expedition through the soundside waters of the refuge, learn nature photography tips from experts, or enjoy a guided stroll through some of the lesser-discovered refuge areas. With a constant rotation of daily activities, attendees will find their Wings Over Water schedules overflowing with fun events, adventures, educational sessions and new discoveries. When Hurricane Irene opened up a new inlet north of Rodanthe in 2011, she also opened up a new Pea Island National Wildlife Refuge habitat. The new inlet, (locally known as Irene's Inlet), is located a couple miles south of the visitors' center and has become an exceptionally popular location for surfers, kiteboarders and fishermen for the easy access to both the ocean and sound, and the fantastic waves and fishing conditions. For a beach experience unlike any other on the Outer Banks, take a trip through this region, and be on the lookout for shorebirds, blue crabs, seashells, and a variety of other natural treasures that can be consistently found along the inlet's shoreline. Travelers are free to park along NC Highway 12 and scope out the scene, (unless otherwise indicated by roped off enclosures), so feel free to take a break from the road, step outside the car, and stretch. Virtually every landscape is covered with dozens of lingering shorebirds on both the ocean and soundsides of the highway, making every stretch of the highway uniquely scenic. Just be sure when parking to steer clear of the highway and bordering bike ramps, and to park in a hard-packed grassy or flat area. A car can easily get stuck in the soft sand on Hatteras Island, even just inches from the main roads. Summer and shoulder season visitors will want to load up on bug spray before their refuge visit, as the soundside trails and marshy areas are prime mosquito breeding grounds. In addition, watch out for snakes along both the North Pond and Salt Flat trails, which can make seasonal and sometimes frightening appearances. While the old adage "they're more scared of you than you are of them" certainly applies, visitors are cautioned to be careful nonetheless and to wear sturdy shoes to protect them from critters and small thorny cactuses or vines along the trail. If you're planning a stroll or a soundside paddle, try to schedule it around sunset. In the evenings, the sky and the water light up with shades of purple, pink, orange and lemon yellow, and visitors can enjoy the waters and marshes of the Pea Island National Wildlife Refuge in an entirely new perspective. Bring along a picnic blanket or a couple of beach chairs, and spend a quiet or even romantic evening sitting back, relaxing, and just taking it all in. Clearly, the Pea Island National Wildlife Refuge is more than just a pretty stretch of NC Highway 12. The refuge serves as an imperative habitat for hundreds of species, a launching point for dozens of government sponsored educational programs and events, and a fun free adventure for thousands of vacationers every year. On your next trip through Hatteras Island, take a break from the drive and step out for a little exploring. 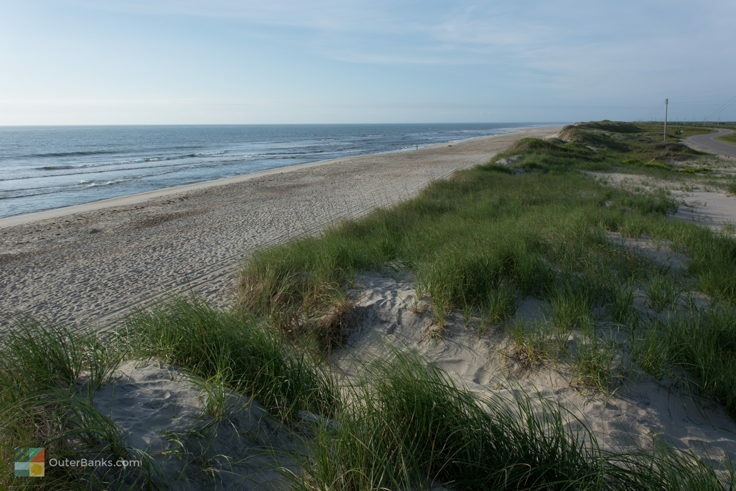 With plenty of gorgeous beaches, public parking areas, and incredible nature trails wide open to the public, a side-trip to the Pea Island National Wildlife Refuge may very well become the highlight of your Hatteras Island vacation. Don't forget the camera, and be prepared to get up-close-and-personal with some of the region's most famous migrating residents. Where is the Pea Island National Wildlife Refuge? The Pea Island National Wildlife Refuge is situated on Hatteras Island, and spans from the southern end of Oregon Inlet and the Bonner Bridge to the northern limits of the town of Rodanthe. How do you get to the Pea Island National Wildlife Refuge? From the north, visitors can reach the Pea Island National Wildlife Refuge via NC Highway 12 south. The refuge begins after the Bonner Bridge. From the south, visitors can head north towards the tri-villages. The refuge begins just outside of the town of Rodanthe. How big is the Pea Island National Wildlife Refuge? The Pea Island National Wildlife Refuge is comprised of 5,823 acres of land, as well as 25,700 acres of water, and extends from Oregon Inlet to the town of Rodanthe on Hatteras Island. How many miles long is the Pea Island National Wildlife Refuge? The Pea Island National Wildlife Refuge is roughly 13 miles long, from Oregon Inlet to the northern border of Rodanthe. Is the Pea Island National Wildlife Refuge part of the Cape Hatteras National Seashore? The Pea Island National Wildlife Refuge is separate from the Cape Hatteras National Seashore, but it does border the seashore on either side. What are the special events at the Pea Island National Wildlife Refuge? The Pea Island National Wildlife Refuge hosts a number of free programs for families in the summer months, including educational talks and children’s craft and learning programs. However, the most celebrated event at the Pea Island National Wildlife Refuge is the annual Wings Over Water festival, which is a multiple-day birding festival that is held every year in October, and which sometimes has an “Encore” weekend in December. What events take place during the Wings Over Wildlife Festival? The Wings Over Water Festival has a myriad of events that are spread out across multiple days and multiple refuges in the Outer Banks area. Popular excursions and events within the festival include guided birdwatching hikes, kayak tours, boat or pontoon boat tours, tram tours, art classes, guest lecturers, and more. Where can you park at the Pea Island National Wildlife Refuge? The Pea Island National Wildlife Refuge has a Visitors Center and paved parking area for visitors, which is located approximately 4 miles south of the Bonner Bridge, and 8 miles north of the town of Rodanthe. Visitors can also park at multiple spots along NC Highway 12, provided they park well off the road, and be on the lookout for soft sand on the highway’s shoulders. 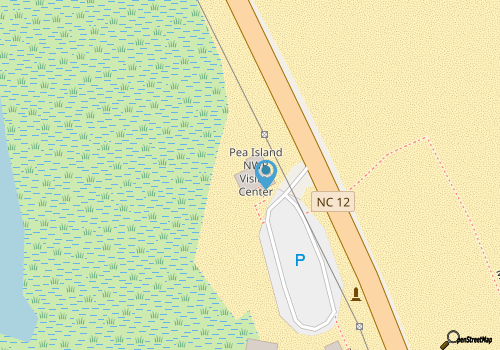 Is there a visitors center for the Pea Island National Wildlife Refuge? A Visitors Center for the Pea Island National Wildlife Refuge is located approximately four miles south of Oregon Inlet and the Bonner Bridge. The Visitors Center features exhibits and information on the refuge, as well as an array of gifts, maps, and other refuge mementos and / or information. Are there hiking trails at the Pea Island National Wildlife Refuge? The Pea Island National Wildlife Refuge has two primary hiking trails, which are close to the Visitors Center. The North Pond Walking Trail is .5 miles long, is universally accessible, and leads to a boardwalk over the area’s “turtle ponds,” as well as three observation platforms and a two-story tower. The multiple mile Salt Flats Wildlife Trail includes portions of the refuge, as well as a loop route that borders a stretch of NC Highway 12. How long are the trails at Pea Island National Wildlife Refuge? The North Pond Walking Trail is ½ mile long, while the Salt Flats Wildlife Trail can extend for several miles, depending on how far explorers want to wander. Are there restrooms at the Pea Island National Wildlife Refuge? 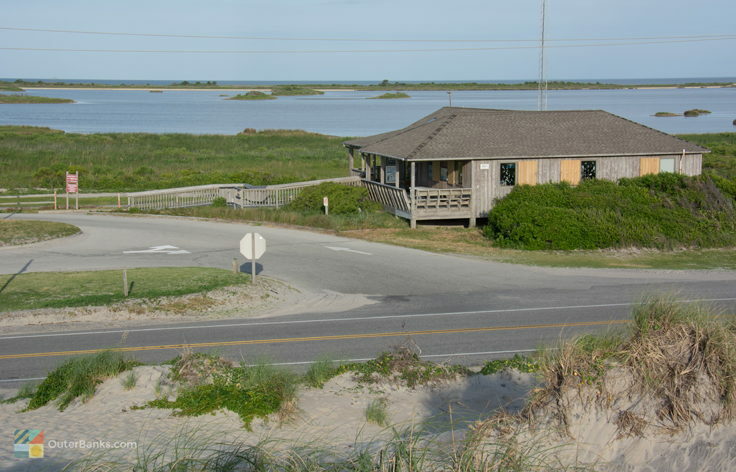 The Pea Island National Wildlife Refuge does offer restrooms, which are located next to the main Visitors Center and parking area. Is there a beach access at the Pea Island National Wildlife Refuge? 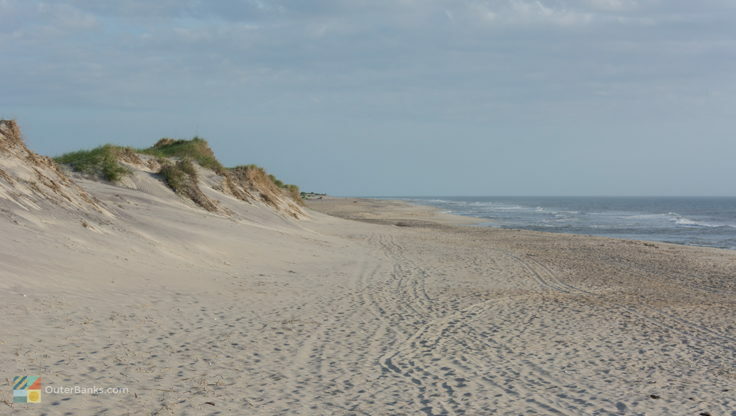 There are multiple beach accesses throughout the Pea Island National Wildlife Refuge. The easiest way to reach the beach from the refuge is to park at the Visitors Center and hop across NC Highway 12. A sandy path to the oceanfront is located just across the road. Are there shells at the Pea Island National Wildlife Refuge? The beaches that border the Pea Island National Wildlife Refuge are known for decent shelling and unusual finds, due to their proximity to Oregon Inlet. Nicely isolated, the shorelines of the Pea Island National Wildlife Refuge are a fine place to hunt for shells, sea glass, and other unique beach treasures. Can you park anywhere along NC Highway 12 in the Pea Island National Wildlife Refuge? Visitors can park all along NC Highway 12 in the Pea Island National Wildlife Refuge, except in construction areas or special marked areas. Visitors will want to use caution, as the highway’s shoulders can be comprised of deep and soft sand, which can cause a vehicle to get stuck. 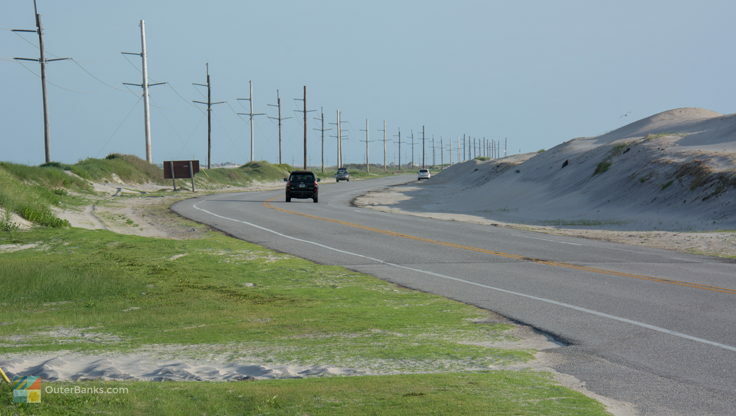 Can you drive on the beach at the Pea Island National Wildlife Refuge? Driving on the beach is not allowed anywhere within the Pea Island National Wildlife Refuge, from Oregon Inlet to Rodanthe. How many birds are at the Pea Island National Wildlife Refuge? The Pea Island National Wildlife Refuge attracts roughly 400 different species of migrating birds every year. What are the rare birds at the Pea Island National Wildlife Refuge? Visitors can expect to see some unusual species among the 400 or so species of birds that flock to the Pea Island National Wildlife Refuge. Expert birders will want to watch for rare species like the long-billed curlew, piping plover, and the seasonal white pelicans. When do birds migrate to the Pea Island National Wildlife Refuge? Though birds migrate to and / or visit the Pea Island National Wildlife Refuge throughout the year, the winter months are the best time to catch seasonal visitors including snow geese, white tundra swans, white pelicans, gadwalls, northern pintails, and many other waterfowl species. When is the best time to visit the Pea Island National Wildlife Refuge? Birdwatchers flock to the Pea Island National Wildlife Refugein the winter months to catch wintering waterfowl such as tundra swans, snow geese, and even white pelicans. With that being said, the refuge is also popular in the spring and the fall, which is when the annual Wings Over Wildlife is held. Summertime visitors are welcome as well, and may want to spend some time at the adjacent oceanfront beaches, which are nicely warm and uncrowded all season long. Can you kayak in the Pea Island National Wildlife Refuge? Visitors are free to kayak and explore the waterways and open Pamlico Sound terrain of the Pea Island National Wildlife Refuge. Boat launch areas are located close to Oregon Inlet, as well as a couple miles south of the Bonner Bridge, close to the Pea Island Interment Bridge. Are there snakes at the Pea Island National Wildlife Refuge? The Pea Island National Wildlife Refuge can attract snakes in addition to its many birds, amphibians, and mammals. Watch out for poisonous water moccasins, which can make appearances near marshy areas and soundside waters. Snakes are less of a threat in the cooler winter months, however. Are there mosquitos at the Pea Island National Wildlife Refuge? The Pea Island National Wildlife Refuge can be a bit buggy in the summertime, especially when there is little to no wind. Mosquitos are generally not a problem, however, from fall until early spring. What are the habitats in the Pea Island National Wildlife Refuge? The Pea Island National Wildlife Refuge boasts a wide array of habitats which includes maritime forest, salt marshes, oceanfront beaches and sand dunes, brackish ponds, and open Pamlico Sound waters. Does it cost any money to visit the Pea Island National Wildlife Refuge? The Pea Island National Wildlife Refuge is completely free to the public. Large scale special events, like the annual Wings Over Wildlife Festival in the fall, may have a fee to participate. Can you camp at the Pea Island National Wildlife Refuge? Camping is not allowed within the Pea Island National Wildlife Refuge. A campground is located just across the Bonner Bridge, which is managed by the National Park Service, and the towns of Rodanthe, Waves, and Salvo on the southern borders of the refuge have a number of campgrounds for visitors as well. Where can you stay near the Pea Island National Wildlife Refuge? Visitors will find a number of vacation rental homes in the towns of Rodanthe, Waves, and Salvo, which are located just south of the Pea Island National Wildlife Refuge. In addition, there are a number of campgrounds in these communities, as well as a campground located just north of Oregon Inlet, which is managed by the Cape Hatteras National Seashore.